Over the years, bridge engineers have been concerned about the response of prestressed concrete (PC) girder bridges that had been hit by over-height vehicles or vehicle loads. When a bridge is struck by an over-height vehicle or vehicle load, usually the outside and in some instances one of the interior girders are damaged in a bridge. The effect of intermediate diaphragms in providing damage protection to the PC girders of a bridge is not clearly defined. This analytical study focused on the role of intermediate diaphragms in reducing the occurrence of damage in the girders of a PC-girder bridge that has been struck by an over-height vehicle or vehicle load. The study also investigated whether a steel, intermediate diaphragm would essentially provide the same degree of impact protection for PC girders as that provided by a reinforced-concrete diaphragm. This investigation includes the following: a literature search and a survey questionnaire to determine the state-of-the-art in the use and design of intermediate diaphragms in PC-girder bridges. Comparisons were made between the strain and displacement results that were experimentally measured for a large-scale, laboratory, model bridge during previously documented work and those results that were obtained from analyses of the finite-element models that were developed during this research for that bridge. These comparisons were conducted to calibrate the finite element models used in the analyses for this research on intermediate diaphragms. 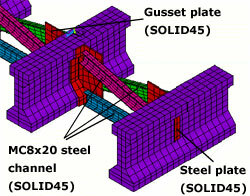 Finite-element models were developed for non-skewed and skewed PC-girder bridges. Each model was analyzed with either a reinforced concrete or two types of steel, intermediate diaphragms that were located at mid-span of an interior span for a PC-girder bridge. The bridge models were analyzed for lateral-impact loads that were applied to the bottom flange of the exterior girders at the diaphragms location and away from the diaphragms location. A comparison was conducted between the strains and displacements induced in the girders for each intermediate-diaphragm type. These results showed that intermediate diaphragms have an effect in reducing impact damage to the PC girders. When the lateral impact-load was applied at the diaphragm location, the reinforced-concrete diaphragms provided more protection for the girders than that provided by the two types of steel diaphragms. The three types of diaphragms provided essentially the same degree of protection to the impacted, PC girder when the lateral-impact load was applied away from the diaphragm location.